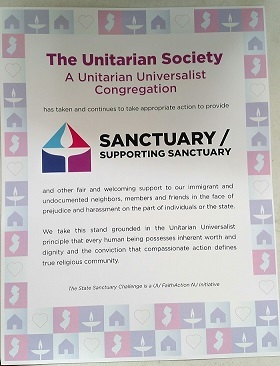 We, The Board of Trustees of The Unitarian Society, A Unitarian Universalist Congregation resolve to be a participating congregation in the UU Faith Action Sanctuary Challenge. We understand that this challenge in aimed at getting 100% of UU congregations in NJ to commit to the important work of standing in solidarity with immigrant communities and we fully endorse this effort. Our Board voted to become active members of Interfaith RISE, a large coalition of religious and community groups that is an approved U.S. Refugee Resettlement agency. One of our members attends meetings regularly representing TUS. Members of our congregation are active participants in a rapid response team called DIRE and we as a congregation have supported DIRE financially. At this time one member of our congregation does a weekly shift of “court monitoring” at the North Brunswick municipal court, the place of past ICE activity. Recently a member of our congregation secured a full scholarship to Rutgers for an Afghan refugee and has raised funds for books and fees as well. 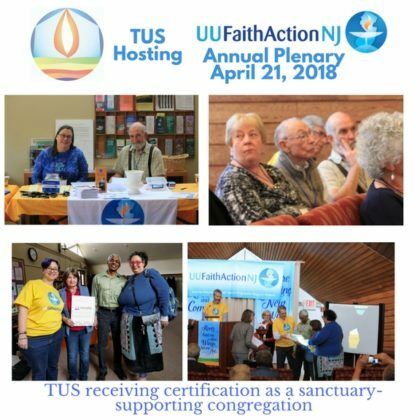 Last October our minister preached about giving refuge and after the service, a planned informal polling among congregants indicated that The Unitarian Society would actively support Sanctuary Congregations in our area. Very shortly thereafter the Sanctuary church closest to us geographically (the Reformed Church of Highland Park) did welcome some immigrants into Sanctuary. Members of TUS performed Sanctuary Sentry duty and help recruit others for Sentry duty as well. Last September TUS hosted the group Migrant Justice for a potluck dinner and talks about their organizing among dairy farmworkers in VT. We felt this was particularly successful in that besides educating members of our own congregation, this event attracted a number of members of New Labor, a local labor organization that works to improve conditions for low paid immigrant workers. We are pleased to become known as allies to New Labor. In the spring of 2017 we presented a Sunday Service on Dreamers with a talk by an undocumented student who educated us regarding the way in which she discovered her status, the roadblocks she faces in continuing her education and contributing to U.S. society. In the spring of 2017 Middlesex County adopted a policy to become Fair and Welcoming by refusing 287g agreements and writing explicit policy limiting the information that local law enforcement will pass along to ICE. Members of TUS were active in the local coalitions that initiated and brought this policy to fruition by meeting with County Freeholders and attending/speaking out at Freeholder meetings. **287g is the name of the contract that ICE tries to get counties all over the country to sign. It deputizes county law enforcement to act as federal ICE agents.